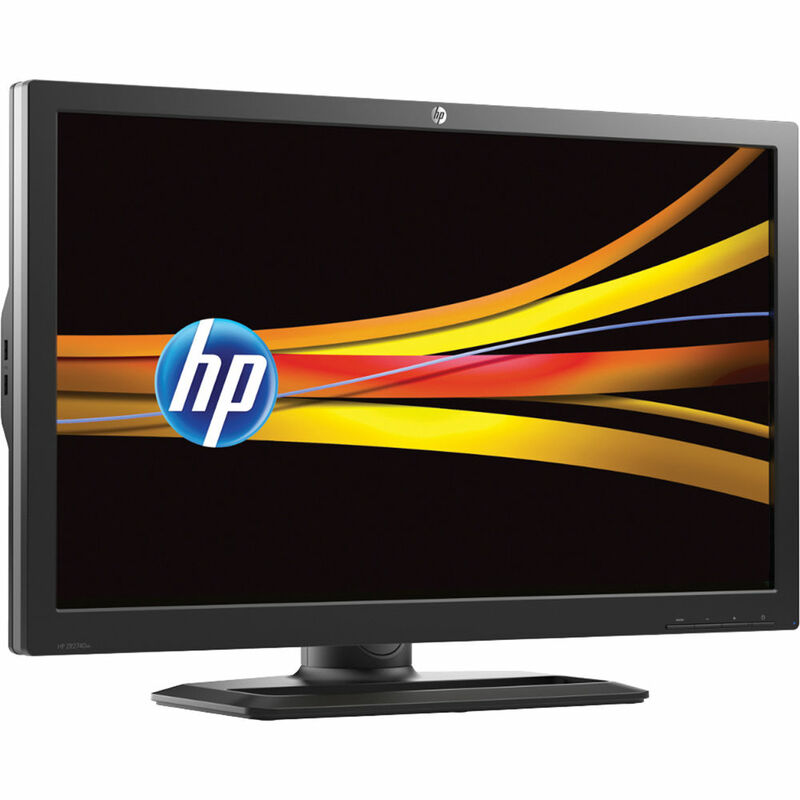 The ZR2740w 27" LED-Backlit IPS Monitor from Hewlett Packard is a high-performance LCD display, perfect for use in color-critical environments. The display uses an IPS panel, which can reproduce an amazing 1.07 billion colors. An integrated 4-port USB 2.0 hub allows for easy device connectivity. The display features an impressive industrial design with a black and brushed aluminum finish. Its stand features rotation, swivel, and height adjustment. The display features a 2560 x 1440 native resolution, 16:9 aspect ratio, 1000:1 contrast ratio, 380cd/m² brightness, 12ms response time and 178°/178° viewing angle. Note: Color calibration must be done through your graphics card. The monitor itself does not have color calibration options. Box Dimensions (LxWxH) 30.0 x 19.1 x 13.0"
ZR2740w 27" LED-Backlit IPS Monitor is rated 4.5 out of 5 by 55. Rated 5 out of 5 by Kent F. from Solid proformer in the studio We just purchased 4 to go with the 2 we already had. Not a dead pixel in the lot. These are exceptional monitors for the price. Color accuracy does not change as your viewing angle changes until you get significantly past 40 degrees or so and then it is fairly slight. In the studio we go by numbers, but it is extremely important that what our eyes see verifies what we read. We need to make quick judgements and we can now trust that photographers will see the problems more often and not let anything by them. Monitors were fairly consistant out of the box, but calibration is a must if you want the best from these. Rated 2 out of 5 by Garycal from Great performance when it does not fail I have two of these. First one I bought about 2 years ago from another vendor and had to return it to get one without scuff marks inside the surface cover. Since then the replacement worked fine. Just this April, I ordered one from B&H to use at my second home. It lasted exactly 27 days before it failed. Screen just went black and cannot get the image back. B&H was lighting fast about the RMA, but alas HP HAS TERRIBLE QUALITY CONTROL. No wonder they are slowly going out of business. So unless you are prepared to return one of these, find something else. It's just too bad because the performance is excellent for the price. Rated 4 out of 5 by lucentsteve from Excellent Monitor, but a small warning.. After I received this monitor (and hooked it up) I found out that the graphics card on my computer did not support the 2560x1440 monitor resolution. There were NO minimum requirements noted on the B&H website warning that this monitor will not work unless your graphics card supports the resolution mentioned above. I had to upgrade my graphics card and power supply to get this monitor to work.That being said...it looks beautiful. Couldn't be happier with the quality. I'm only giving it (4) stars due to all the hassle to get it to function properly. Rated 5 out of 5 by SANWIZARD from Outstanding display quality........ I have owned several 27+ high end LCD monitors. I bought this HP monitor for my daughter who needed a larger screen for a college. I looked at various cheaper 27 TN displays and the image quality of these cheaper monitors is horrible. For the money, the HP ZR2740w is an outstanding display. I have 2 Apple 27 Cinema displays with the glossy screen. Side by side the Apple's glossy screen is a tiny bit sharper at the expense of glare in brightly lit rooms. Also, the HP ZR2740W and the Apple 27 Cinema Display use the same IPS LCD panel from LG. The HP uses true WLED backlighting (across the back), Apple uses edge LED backlighting to make the Cinema Display as thin as possible. WLED backlit is typically superior to edge lit displays in terms of uniformity and bleed.Although it lacks OSD controls, the ZR2740W out of the box settings are spot on in terms of color calibration....maybe a touch bright. It does have a anti glare coating, but, IMHO it is not as bad as Dell and some other IPS displays, and at native resolution, text is crisp. I have 2 Apple Cinema displays to compare side by side and there are pros and cons to each. The HP ZR2740w to my door is 30% cheaper than @, and for general use is an outstanding display. Rated 5 out of 5 by Spunky from Best Bang for the Buck I decided to try this HP monitor for photo editing and am very satisfied with the image quality...very sharp and bright with vivid colors. It's connected to a 2010 17 MacBook Pro via a 6' StarTech Mini DisplayPort Male to DisplayPort Male Adapter Cable with full resolution as a second display. A really handy feature of this monitor is dual inputs...one display port and one DVI...and you can switch between the two using a front panel button. This saves the cost of having to use a KVM switch to hookup two machines. The DVI is connected to my Linux server with the included cable at full resolution. The monitor stand has a better range than most for verical and horizontal adjustments. Rated 2 out of 5 by Tommy from Not Working for me I was unable to get this to work with my MacBookPro late 2013 15 retina. I wanted to have an external monitor that would do 2560x1440 and this seemed like a good deal. I could not get it to display anything more than 1280x720. I bought every cable possible and adapters for the Mac and visited dozens of forums to figure this out. Even took it in to Apple Genius Bar and no one was able to get it to work. The MacBookPro did get tested with other monitors and it worked fine at the 2560x1440 resolution. These two just don't seem to be compatible. I had to return the monitor. Sad! Rated 4 out of 5 by Craig66 from Quality Product Primarily used for Surfing the web and photo editing. Everything sbout this monitor spells quality: the stand is solid and adjusts easily, the monitor has good clarity and beautiful colors, no dead pixels,and a great value. The picure is too bright out of the box but easy to adjust. In order to get the full resolution on a MacBook Pro it was necessary to purchase an Apple Mini Display Port to Dual-Link Display adapter for $. The reason for not giving it 5 stars is, there is no downloadable program for Mac to adjust color even though they look good from the factory. Rated 5 out of 5 by Kobster from Great Value Originally I was looking into buying the HP ZR30w 30 monitor, but once I came across this monitor I know this is monitor makes so much more sense!So you lose a few pixels in comparison to the 30, but you save a whole lot of $$$. I couldn't be more happy with this monitor - colors are beautiful and back light is great. Connected to my MacBook Pro with DP to Mini DP and colors for the most part match the colors on the MacBook screen. I edit photos and videos and it all looks great!Shipped the same day I ordered and delivered pretty quickly - B&H never disappoints me!